Over the past few years, I’ve become increasingly aware of an unusual type of mineralization that occurs in a small percentage of Keokuk geodes. When such a geode is cut or broken open, one occasionally finds that the innermost, or euhedral, crystal layer consists of interpenetrating quartz crystals that approximate a cubic shape. These crystals are never more than about a quarter-inch long on a side, and almost always are covered with an opaque, grayish to whitish coating of chalcedony, which somewhat hides their form. To my knowledge, these crystal forms have been largely, but not exclusively, found within geodes collected from the vicinity of Hamilton, Hancock County, Illinois, although a more widespread occurrence seems likely. Although Keokuk geodes have been widely collected for decades, there still seems to be almost no information on the occurrence or identification of these crystal forms, which have been curiously overlooked. In this article, I wish to present my preliminary conclusions regarding them, with the hope of spurring additional interest and/or investigation into their origin(s). 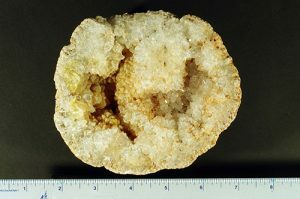 Keokuk geodes are named for their occurrence within the Tri-State area of southeastern Iowa (centered upon the city of Keokuk) and adjoining portions of western Illinois and northeastern Missouri. This concentration extends outwards in a radius of about 35 miles from the confluence of the Des Moines and Mississippi rivers. There, geodes are principally found in the Mississippian-age beds of the lower Warsaw Formation, which are roughly 340 million years old. The Warsaw Formation is composed chiefly of shales, dolomites and limestones that were laid down on the bottom of a shallow sea during the early Carboniferous Period. 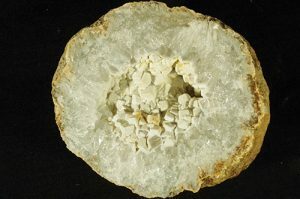 Keokuk geodes are often concentrated in certain layers, some of which are poorly consolidated—circumstances which aid their removal from the surrounding matrix. While most geodes are under 6 inches in maximum dimension, some as large as 1 or 2 feet across have been recovered. A number of conclusions about the formation of Keokuk geodes have long been accepted by area geologists. It is believed that all such geodes have passed through at least three principal stages of development. 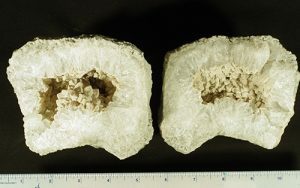 During the first stage, a nodule or concretion began to develop on the ocean floor by the chemical precipitation of calcite (CaCO3) or anhydrite (CaSO4). Over time, this concretion was slowly buried under an accumulation of sediments and organic debris, which under pressure was gradually transformed into sedimentary rock. During the second stage, either groundwater or hydrothermal solutions acted to dissolve the original nodule or concretion, thereby creating an open cavity within the sedimentary rock. Finally, during the third stage, additional mineral-laden solutions of varying chemical composition and temperature circulated through the open cavity and slowly redeposited new growths of crystals that would eventually comprise the Keokuk geode. We can be certain of these steps having occurred from the individual preservation of all three geode stages in strata of the Warsaw and related formations. 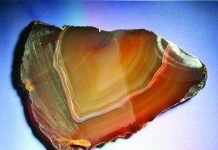 To date, the most authoritative study of these geodes was that published by Stephen R. Sinotte in 1969, entitled The Fabulous Keokuk Geodes. Yet, there is no mention anywhere within that volume of the pseudocubic quartz crystallization described here, which remains puzzling. Its occurrence must not have been recognized at the time of its publication. Despite the large upsurge of interest and collection of these geodes in recent decades, no comparable and updated account of them has yet appeared, after almost 50 years! were initially lined with quartz (along with a thin layer of chalcedony comprising the outermost shell). 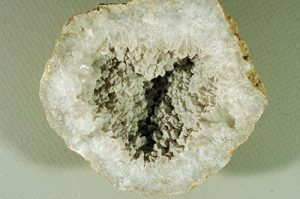 This initial lining of the geode cavity is termed the anhedral layer, and refers to the fact that, as the crystals grew inward, no terminations were formed along the outside edge. 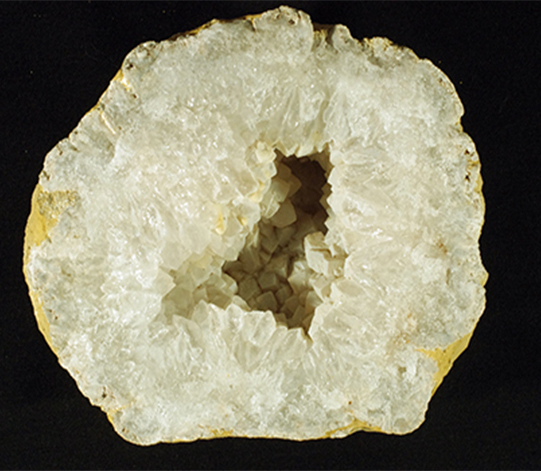 Among the smaller Keokuk geodes, this growth stage might have proceeded all the way into the center, in which case the cavity became entirely filled with a solid quartz lining. The quartz comprising the anhedral layer consists of ordinary crystals having six-sided prisms and pyramidal terminations. The flat facets of those terminations sparkle brightly in the light as the geode is examined from different angles, and this is what makes them such attractive and desirable objects for collectors. No two geodes are ever exactly alike, because each one went through slightly different patterns of growth, all the while encased in bedrock. Quartz, however, is not the only mineral to be deposited within the linings of Keokuk geodes. Calcite is probably the second most common mineral to be laid down, and through various chemical conditions and processes, produced numerous forms and colors that make it a valued occurrence. These can include larger, clear to opaque, whitish rhombs, along with miniature “nailhead” crystals. However, I am going to focus on the most relevant form, which consists of a layer of brownish, iridescent crystals that was deposited on top of the anhedral quartz layer. These brownish calcite crystals are seldom larger than about 1?8 inch on a side, but have orientations and terminations in just about every direction. For this reason, they are designated the euhedral layer and represent the final significant stage in the geode’s growth. Interestingly, these calcite crystals also sport a pseudocubic habit and often display what are known as penetration twins, wherein two crystals began growing symmetrically in different directions from the same center. For this reason, they warrant further consideration ahead in the search for a possible origin of the pseudocubic quartz crystals, which they superficially resemble. Quartz belongs to the rhombohedral division (and trigonal or trapezohedral class) of the hexagonal crystal system, which means that it possesses a three-fold symmetry about the vertical axis and a two-fold symmetry about each of the three (rather than six) horizontal axes. Ordinarily, quartz crystals exhibit elongate, six-sided prisms (composed of parallel m-faces) and terminations of hexagonal pyramids composed of adjoining r- and z-faces. As previously mentioned, these are the habits commonly encountered in the anhedral layers of Keokuk geodes. But there is an uncommon “equant”, or “pseudocubic”, habit of quartz (also known as “Würfelquarz” or “dice quartz”) in which the r-faces develop to the exclusion of the m- and z-faces. This results in a crystal form that is almost cubic in habit, where the angle between the r-faces is 85° 46’. Smaller m- and z-faces may still be present, which tend to ‘round’ the corners of these pseudocubes. This pseudocubic habit was described and illustrated (Fig. 28, p. 57) in the third volume of the 7th edition of The System of Mineralogy of James Dwight Dana and Edward Salisbury Dana, authored by Clifford Frondel (1962). “Würfelquarz” is also described at www.quartzpage.de/crs_habits.html#Cubic. According to the latter source, small, brownish, pseudocubic quartz crystals known as “Pecos diamonds” have been found along the Pecos River valley in southeastern New Mexico. Only a few other sources of pseudocubic quartz crystals appear to be known throughout the world, with one of them reportedly in the state of Maine. Most of the known occurrences are seemingly limited to low-temperature settings (e.g., sedimentary deposits). How can we be sure that the pseudocubic crystals found in Keokuk geodes are truly made of quartz? This can be readily answered by means of one or more simple tests. While the majority of these crystals are covered on the outside by a coating of chalcedony, the insides of a few such crystals are usually exposed upon the geode’s being cut or broken open. These crystal interiors are clear, have a glassy luster and, if broken, show an irregular, conchoidal fracture. More importantly, their hardness may be readily determined. I have been unable to scratch these crystals with a steel X-acto knife blade (Mohs ~5.5). These observations indicate that the material must be quartz (Mohs 7). Were the crystalline materials to be fluorite (Mohs 4) or calcite (Mohs 3), they would be readily scratched by the knife blade. Besides, fluorite crystals are thus far unknown within Keokuk geodes. Furthermore, dilute hydrochloric acid does not react with the crystal interiors, proving that they cannot be calcite. So, quartz is the only composition that can be readily inferred for the pseudocubes. Two possible origins of these pseudocubic quartz crystals can be readily envisioned, although one seemingly is to be preferred over the other (for reasons described below). In the first scenario, the quartz crystals might have resulted from replacement of previously existing pseudocubes of calcite. If this were the case, then the quartz crystals themselves must be considered pseudomorphs after calcite. More careful study of these quartz crystals ought to resolve whether or not this scenario is plausible. It should also be noted that calcite likewise belongs to the rhombohedral division (but holohedral or scalenohedral class) of the hexagonal system of crystallography. That is why it, too, is capable of forming crystals with a rhombohedral form and, in the case of Keokuk geodes, commonly occurs as the brownish, interpenetrating, pseudocubic crystals in the euhedral layer. As Frondel (p. 239) has reported, pseudomorphs of quartz after calcite are “especially common”. Thus, at first glance, calcite’s replacement by quartz pseudomorphs might appear to be the most plausible origin for these anomalous quartz crystals. However, this pseudomorph scenario requires the occurrence of at least one additional growth stage in the formation of the Keokuk geode. That is to say, a former euhedral layer of pseudocubic calcite crystals first had to be deposited, and then subsequently removed during dissolution and substitution of the calcite by quartz. That process is necessarily more complicated than a simpler, competing scenario, in which the pseudocubic quartz crystals simply precipitated out of solution as the euhedral layer formed inside the geode, after the anhedral layer was originally deposited. Thus, for reasons of simplicity alone, this latter scenario might be preferred over that involving the pseudomorph process. But is it possible to tell which of these two scenarios (pseudomorph after calcite versus original precipitation) is the correct one? In principle, the answer is a firm yes, although to my knowledge such a critical test has not been performed. While both calcite and quartz are capable of forming pseudocubic crystals, the angles between their crystal faces are not the same, and should therefore readily distinguish which process actually occurred. If the pseudocubic quartz crystals display the same angles as the pseudocubic calcite crystals, then the pseudomorph scenario is supported. Otherwise, the quartz crystals must have been formed independently from any calcite in the geode. This test requires extracting crystals of each kind and carefully measuring their interfacial angles. In the absence of that technique, the best answer that I can supply comes from a purely visual inspection made regarding one specific Keokuk geode half from an unknown location. This geode is unusual in that not all of the pseudocubic quartz crystals have been coated with chalcedony. One side of the geode has ordinary hexagonal quartz crystals in the anhedral layer, while the other side has been largely overfilled with euhedral pseudocubic quartz crystals. But in the narrow transition between the sides, a few euhedral quartz crystals escaped being coated with chalcedony and thus are exposed in their unaltered forms. more cubic habit (i.e., angles more nearly orthogonal) than those displayed by the brownish, pseudocubic calcite crystals observed in another, unrelated Keokuk geode. Those calcite crystals are clearly more rhombohedral in appearance (that is, having angles which are more acute and obtuse), which leads me to the conclusion that the pseudocubic quartz crystals (in this one geode, at least) arose from original precipitation and not by substitution as pseudomorphs after calcite. 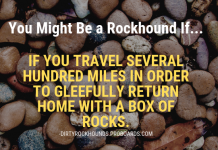 If that is the case, then these types of Keokuk geodes might represent the most common occurrence of pseudocubic quartz crystals that are currently known. At present, I know of only two localities where geodes of this type have been found. Both are located in the Hamilton, Illinois, area. One is Jacob’s Geode Shop and Mine, where collectors have long been able to dig their own geodes under a fee-collecting arrangement. 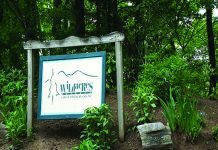 The other is the Miller Quarry; permission to collect there must be obtained in advance. 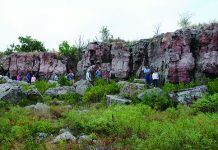 The quarry specimens I have obtained were originally collected by Northwest Illinois Rock Club member Thomas Gitchel, and I purchased them at the club’s annual show. But other localities, sharing the same (or closely related) stratigraphy, and therefore geode development, likely exist apart from these two. One of the remaining questions to be answered is, “Why has it taken so long to recognize or identify this pattern of crystallization in Keokuk geodes?” In my opinion, it has likely arisen because of two or three principal factors: First, nearly all of the pseudocubic quartz crystals produced in these geodes were later coated with the whitish chalcedony, which itself is nearly impossible to remove. Second, this coating consequently hid the true identity of these quartz crystals, and led to the assumption that they were instead pseudocubic calcite crystals that lay underneath it. Third, more astute collectors might have recognized the composition of these crystals as quartz, but assumed that such crystals had been formed as pseudomorphs after calcite. For these reasons, such geodes and their crystals were likely deemed uninteresting and were subsequently ignored. A deeper question that I cannot answer concerns the exact physical conditions under which these pseudocubic quartz crystals precipitated inside the Keokuk geodes. So little has apparently been learned about this crystal habit that additional research is clearly called for. Almost certainly, the geochemical and/or temperature relations needed to produce this crystal habit were significantly different from those that led to the formation of ordinary hexagonal prism habits in the anhedral quartz layer.